ArcGIS Platform Now Supports "MicroStrategy"
MicroStrategy users now have access to the ArcGIS platform with Esri Maps for MicroStrategy. For decades, Esri has been bringing ArcGIS to users, departments, and systems within organizations. Business intelligence (BI) is ripe for a geographic perspective, and Esri is releasing its latest offering for the BI space—Esri Maps for MicroStrategy. This nondisruptive solution plugs into the MicroStrategy dashboard design and viewing workflows, enabling users to analyze BI data in a geographic context. Business analysts will be able to create, integrate, customize, and distribute interactive Esri maps within reports and dashboards. Every BI application has a spatial context. By linking business results with maps, BI users have a new perspective to identify patterns and correlations based on geography. 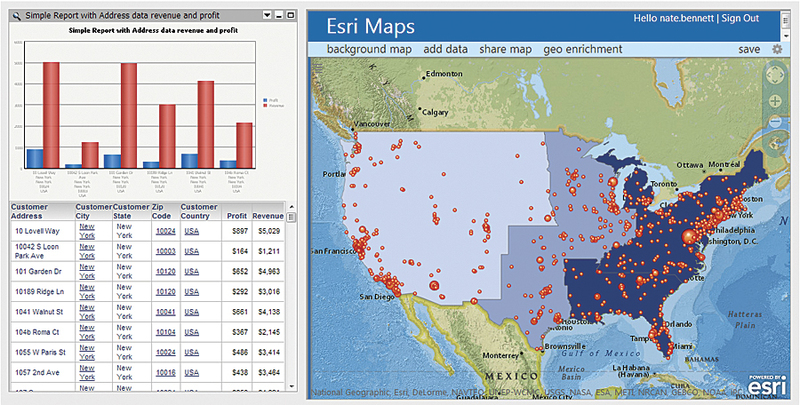 With Esri Maps for MicroStrategy, users can bridge the gap between business metrics and location. Esri Maps for MicroStrategy is designed for the MicroStrategy user and does not require previous GIS experience. This zero-coding solution lets users employ simple mouse gestures to build and explore map-enabled reports and dashboards. Esri Maps for MicroStrategy integrates ArcGIS with the MicroStrategy architecture, leveraging in-place security, deployment capabilities, and scalability. The result is a truly enterprise location analytics solution. To learn more about Esri Maps for MicroStrategy, visit esri.com/mstrmaps.